I return from the annual conference of our nation’s diabetes educators with a sobering message: Not only are diabetes educators tasked with the care of America’s 24 million people with diabetes, but they are now tasked with preventing type 2 diabetes. The U.S. health care reform bill comes with a provision to establish a National Diabetes Prevention Program. This means an expanded role for diabetes educators in the prevention of diabetes. 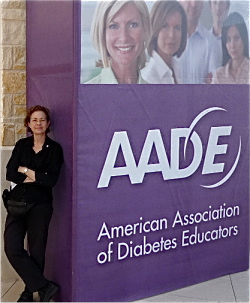 Deborah Fillman, President of the American Association of Diabetes Educators (AADE), delivered this message as an almost honorific call to the few thousand educators, nurses, dietitians, pharmacists and physicians gathered to expand their professional credits and learning in San Antonio, Texas. Yet our diabetes educators, committed and passionate as they are, are frequently overworked, underpaid and lowly regarded in the medical hierarchy. And now they have been tagged with an enormous responsibility; they are not only co-responsible for their patients’ health, but for America’s health. Because the prescription for preventing type 2 diabetes is the same one we should all be following — eat healthy foods and smaller portions, maintain a normal weight, engage in physical activity, manage your stress and smile more. But expecting diabetes educators to keep all of America healthy is absurd. It’s up to each of us to take responsibility for our health. Another pivotal message came from Cleveland Clinic’s Chief Wellness Officer, and Dr. Mehmet Oz’s writing partner, Dr. Michael Roizen. Closing the four-day conference Roizen’s presentation drove home the impact of lifestyle on premature aging, this coming tsunami of diabetes and chronic illness. By now I assume you want a little good news so here it is: We get to control these four factors. But “You can’t make a deal with food!” Roizen repeated again and again. What we eat either turns on our genes for disease or not. And while you can burn off extra calories with exercise, eating only a moderate amount of foods high in saturated fat, salt and sugar turns on most people’s genes for type 2 diabetes, heart disease, high blood pressure and obesity. For this very reason type 2 diabetes does not usually present as a single condition. Most often it comes with heart disease, high blood pressure and obesity. Most people with type 2 diabetes die of heart disease which they already have when diagnosed as a consequence of obesity. Heart surgeon, Robert Chilton, gave no less than three chilling presentations on diabetes and heart disease during the conference. Roizen was responsible for spearheading one of the most successful national programs for improving health, Lifestyle 180, piloted at Cleveland Clinic. Roizen’s program was successful because he was a true leader; he made decisions that fully supported his mission of creating a healthful environment. It’s not an over statement to say he turned Cleveland Clinic and its campuses upside-down. Roizen stocked vending machines with only healthy food, removed drinks with sugar additives, took fryers out of the cafeteria and provided free smoking cessation, exercise and yoga classes and the time to take them. He created an infrastructure for health while driving down costs. The program is now available to all. We need this kind of leadership replicated across America. One of the highlights of the conference, for me, was a theatrical performance sponsored by Amylin called “Close to the Heart.” It was performed by real actors and written by award-winning playwright, Michael Slade. The play will soon be available as cinematic learning modules to help educators and patients with the monumental task of developing healthier lifestyle habits. Manny Hernandez of Diabetes Hands Foundation presented a new tool in the form of a social media game on Facebook called Healthseeker. The game provides education and inspires moving toward one’s goals as you play with others, who may serve as both competition and support. In the exhibition hall I also saw a few small innovations like teeny, tiny pen needles from Becton, Dickinson and Company called nano, good news for those who use insulin pens. But what was glaringly absent was not a lack of tools for managing diabetes and blood sugar–but out-of-the-box products and interventions to support lasting lifestyle changes. Diabetes educators have a massive job to do helping patients manage and prevent diabetes. And we cannot put this responsibility solely on their shoulders. We must each assume individual responsibility for our health and make it clear that we want business and government leaders to provide us an environment that supports health. If you don’t have type 2 diabetes, don’t get it. Right now the closest thing we have to a “cure” is prevention. If you do have diabetes, learn everything you can and decide each day to do the things that support your health. Then maybe one day America, currently a leading nation in chronic illness, will lead the world in wellness. Now that’s a conference I would love to go to. Disclosure: I have not been asked to write this article nor do I have any financial relationship with any of the companies mentioned. Such an informative post about diabetes. Thanks for sharing this post to us.